Advanced Seeds - Purple Diesel Auto. Free US delivery. Purple Diesel Auto. 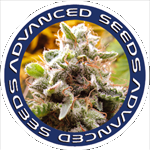 This development by Advanced Seeds is the result of the selection and crossing of the best purple Blueberry and Diesel genetics. Generous harvests with huge amounts of compact hard buds that maintain the intense aroma of blueberries and diesel. Time from germination to harvest: 60 - 65 days. Indoor - outdoor.